With the basic logic gates (NAND, NOR, NOT etc.) 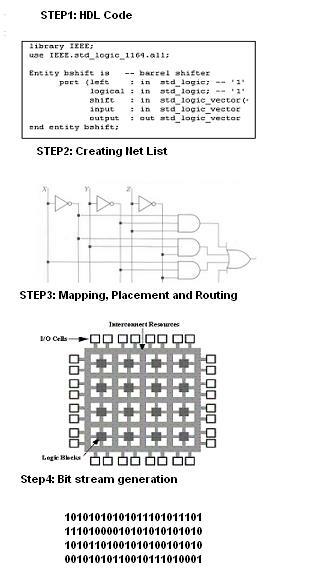 we can build a simple adder to multiplier to complete processor. If we can connect these logic elements inside a chip the way we want using a software program, then that's the FPGA; field-programmable gate array. The software program to define the hardware circuit is called hardware description language (HDL). FPGAs can be used to implement any logical function otherwise available readily by IC vendors. The logic components/logic blocks configured to perform complex combinational functions, or merely simple logic gates like AND and XOR. Logic blocks also include memory elements, which is nothing but a Flip Flop. There will be millions of logic elements in today's FPGA IC. The benefits of FPGAs are, circuit flexibility, programmable hardware, customized circuits can be implemented at lower cost, higher design speed, and can be reprogrammed to fix bugs on field. The flexibility and programming of FPGA is shadowed by few drawbacks too. The drawbacks of FPGA are, they are slower and consume more power, also are more expensive. Once the designer finalizes the hardware circuit on FPGA and if the quantity of the device to be used is large in number (in thousands), than the cheaper solutions is to ASICize the FPGA. These days FPGAs are getting popular due their ability to work as customized embedded microprocessors with related peripherals.These systems called with a new name "system on a programmable chip". Designer can put his own processor, may be a dual core, and his own programming instructions. Good thing is most of the programmable logic vendors, offer ready to use HDL code for processor, memory, and any such complex logic. Latest FPGAs can be used as reconfigurable systems - CPUs that reconfigure themselves to suit the task at hand. Applications: Specific design applications of FPGAs are visual processing (electronic eyes), DSP, software-defined radio, aerospace and defense systems (can be customized as per this field's unique requirement), ASIC prototyping, medical imaging, speech recognition, cryptography, bioinformatics, and many more emerging areas. When it comes to security, FPGAs can be configured for some customized fuzzy and some other crypto logic to protect the system from reverse engineering and hacking. In High performance computing, computational kernels such as FFT or Convolution are performed on the FPGA instead of a microprocessor. 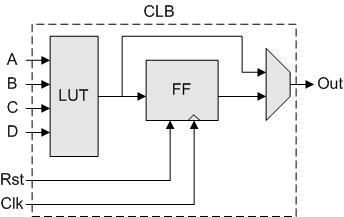 FPGA consists of an array of configurable logic blocks (CLBs) and routing channels. Basic FPGA logic block as shown in the figure below has a 4-input (also 6-input) lookup table (LUT), and a flip-flop. The logic block has four inputs for the look up table and a clock input. Since clock signals are routed via special-purpose dedicated routing networks in commercial FPGAs they are separately managed. Each logic block output pins and input pins can be connected between many such logic blocks through a grid of wires (horizontal and vertical) as per requirements. The FPGA starts with hardware description language (HDL) or a schematic design. The HDL is preferred over schematic design due to HDL's capability in handling large design blocks. It easy to specify them numerically rather than schematic diagram type entry. The advantage of schematic entry is it's easy to visualize a design. Please note advanced EDA tools make the life of FPGA designer far easier by offering lot of automation. Through such EDA tools technology-mapped netlist is generated. The netlist is fitted into the actual FPGA architecture by using a process called place-and-route, mostly done by the proprietary place-and-route software supplied by FPGA vendor. Designer got to validate the map, place and route results by using timing analysis, simulation, and other verification methodologies. After the validation process, the binary file is generated. Binary file is transferred into FPGA/CPLD via a serial interface (JTAG) or to an external memory device like an EEPROM to make the device to work as per the design. In recent times, FPGA design process is simplified and speeded up by using libraries of predefined complex functions and circuits that have been tested and optimized. The other name for these ready to use function is IP core. FPGA vendors increase their selling strength by providing huge caches of third party and own IP cores. With all these tools and advancement FPGA development is made easier. This article is very basic. To learn further on FPGA design, the best source is FPGA vendor's website itself. The Xilinx, Lattice Semi, Actel and Altera all have very nice education material and tutorial sessions on FPGA design and development. Please visit these vendors' websites to add this key skill to your career graph.